In stock -This product will ship today if ordered within the next 14 hours and 11 minutes. Some minerals are thought to be lacking in the modern diet because of local variations of the mineral content in the soil used to grow food. Bio-Health`s Extra Selenium capsules contain biologically active Selenium Yeast, so providing it in an organic food form. In the U.K. the availability from vegetables is low compared to that of countries where growing conditions give rich results. Seafoods probably account for the main dietary source and where shellfish or other seafood is lacking regularly from the diet it may result in inadequate intake. One capsule daily will provide an adequate quantity of this trace element. Encapsulated with; Yeast, Vegetable hypromellose (HPMC), Selenium Yeast (organically bound). Below are reviews of Extra Selenium - 60 x 100mcg Vegicaps by bodykind customers. If you have tried this product we'd love to hear what you think so please leave a review. Some minerals are thought to be lacking in the modern diet because of local variations of the mineral content in the soil used to grow food. 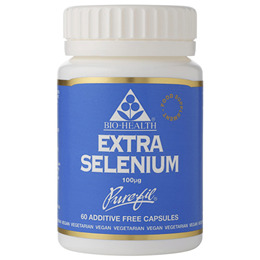 Extra Selenium capsules contain biologically active Selenium Yeast, providing it in an organic food form.